Orignally from Atkinson, NE, Robyn graduated from West Holt High School. She earned her Bachelor's of Nursing from Creighton University in 1995 and both her Master's of Nursing in 2002 and Post Master's Certificate in Nursing Education in 2011 from UNMC at Omaha. In 2002 she was Board certified by the American Nurses Credentialing Center, and she joined Elkhorn Valley Family Medicine in 2011. 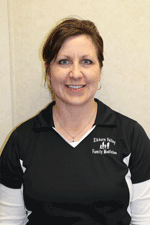 Robyn's special interests include Rural Healthcare and Wellness & Family Medicine. Robyn loves family time, reading, gardening, and nature photography. Her additional certifications include: Advanced Cardiac Life Support (ACLS), Pediatric Advanced Life Support (PALS), and FMCSA Certified Medical Examiner (DOT exams).